If you search your ancestors in Troia, Puglia, info about your Italian family are stored in the City Office archives or at the parishes. In towns and villages of Puglia and in Foggia province registry offices were established in early 1800: it means that you could find information in Troia registrar as of that date. So, if your ancestors were in Troia in the nineteenth or twentieth century, then you could try to contact the City Office of Troia to know more. Before to start your genealogy research in Troia, we suggest you to read our tips for your search . They are useful to search in Puglia and in Troia too. 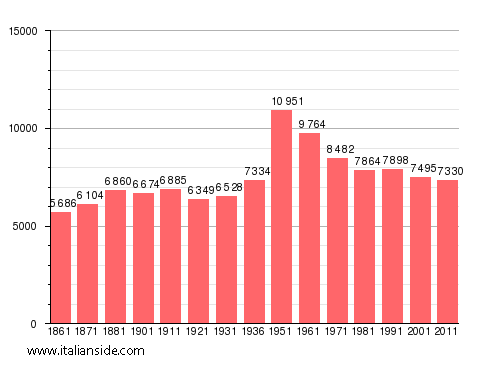 In the next picture you can see the demographic trends in Troia from the Italian Unification (1861). It could be important to know if the last name you are investigating is a frequent surname in Troia. As more your surname is common in Troia, as more it could be difficult to find the right info about your ancestors in Troia archives if you have not exact dates. Bisceglia, Bruno, Calabrese, Caputo, Ciavarella, Ciuffreda, Clemente, Conte, De Luca, De Santis, Delli Carri, D’Errico, Di Bari, Falcone, Ferrara, Fiore, Gentile, Giordano, Guerra, La Torre, Lauriola, Leone, Lombardi, Longo, Marino, Martino, Nardella, Notarangelo, Palmieri, Palumbo, Pellegrino, Piemontese, Prencipe, Quitadamo, Ricci, Rignanese, Rinaldi, Romano, Russo, Sacco, Santoro, Schiavone, Simone, Totaro, Troiano, Trotta, Valente, Villani. Church archives in Foggia province may instead contain even older information, but they are far less accessible from abroad (and almost impossible by email). If you have the opportunity to visit Troia and Foggia province, you could plan to investigate churches’ archives by yourself (or with us! ), but from abroad is very difficult to obtain any result unless you find a reliable local help. Another important source of information is the “Archivio di Stato” (National archive) in Bari. 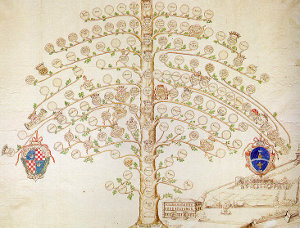 If your research is in a dead end and you need professional help from our local Italian genealogists write to troia@italianside.com our expert in Troia area will study your request and will reply to you with a research plan and a quote. Hi my grandmother name was Giovannina Lizzi born 4.2.1902 and died 8.11.1961 in Troia Italy. She had four daughters Maria ,Lina Carmelina, Ida who is my mother. Lina still leaves in Troia. Maria lives in Milan and Csrmelina died in Troia. My mother Ida passed away in 2017 in Melbourne Australia. I am researching the Roberti family, who I believe lived in Troia and emigrated to the U.S. in the 1880s and 1890s. I know that Michael Roberti was born in Foggia Province in August 1871 and lived in Pennsylvania and Connecticut after arriving in the U.S. Michael’s son, Vito, was born in Pennsylvania in 1907. Vito married Mary Marella, whose family may also have immigrated from Troia. Any information about either family’s roots in Italy would be greatly appreciated. My grandmother, Anna de Mucci (father was Giovanni de Mucci )’ was born on July 26, 1889, born in Troia, Foggia, Italy. Please confirm. Left for the US around 1898. Any information about her family is greatly appreciated. This was my grandfather’s name. He was born 21 May +/- 1888 married to Lucietta Martini. They had 4 children (My mother the oldest Carmela De Stefano born 12 March 1914. I would like to know the names of my ancestors from both my grandfather and grandmother’s side as far back in the 1800. My mother got married to Antonio Bianco on the 10 November 1938 they later immigrated to South Africa. I am registeres in Troia as Maria Lucia Bianco. Any information on Andrew Bonante bornSeptember 8, 1892 in Troia Italy Immigrated to United States in 1900. Any information on Pompia Mary Rubino born December 3 1897. Immigrated to United States in January 1921. I am looking for information on Lodovico (Luigi) Pellegrini born 1876 in Troia. He emigrated to the United States in either in 1892 or 1895. His sister, Clara, also emigrated to the US although I’m not sure when. I am looking foe information about his parents – I have no records of their names or places of birth. Any help would be appreciated. I believe my grandmother may have been born in Troia around 1887. Her name has been spelled as Philomena Bettina, Filomena Bettina, Florence Bettina and Flora Bettina. I am not sure which is correct. I would like to have any records available including birth and, if available, marriage. She married Alphonso Cirone and they had a son Melio Cirone born about 1913. My great-great grandfather – Domenico (spelling?) Di Ponziano was from Troia born (on the record it said) March 26th, 1873. His wife Assunta Di Palma was also from Troia (she was married once before, but he died when they arrived to America) she was born in 1873 as well. I am trying to find out more about their ancestry – who were their parents? What did they do? Any information helps! Thank you! I have Tucci blood from my paternal grandmother. The clan you are referencing i believe settled in Tyler, Pa as miners. My great grandfather, Alfonso Caputo, was born in Troia, Italy in 1859, but I have no official record of the birth and I would like to have one, particularly as it might show his mother and father. Alfonso was married to Antonia Lizzi, and she died and was buried in Trioa around 1894, but I have no official record of the marriage or the death and would like to have these, as they might list Antonia Lizzi’s parents. Finally, Alfonso Caputo’s parents Antonio (might have been Valantonio) and his mother, Costanza Pasqualuccio probably died in Trioa in the late 1800’s, but I can find no record of them. I am told that Antonia Lizzi, Antonio Caputo, and Costanza Pasqualuccio are buried in the graveyard of the church in Trioa. Can you help find the information on these three ancestors of mine? Many thanks. My Great Grandfather, Alfonso Caputo was also from Troia, and I believe he was probably born some time in the mid 19th century, so we might be related. My Grandmother was Carmella Caputo. I don’t know my great Grandmother’s name. Perhaps Antonia Lizzi is my Great Grandmother too. I do know that my Grandmother (Carmella) was born in July, 1893 and that her mother died when she was only 18 months old. Thereafter, her Father remarried and she had a number of step brothers (Jack & Al) & a step-sister, Eleanor. Carmella was my Mother’s mother. She and my Grandfather, Joseph Donvito were married in Allegheny county, PA in 1913. I am the daughter of Nick & Anne (Donvito) Crimi. My Mother’s family was originally from the Pittsburgh area, but they migrated to Akron, Ohio in the 1920’s. My Brother Richard & I are looking for family history. If you were able to obtain any information, please let me know. Thank you. My grandfather Biagio Lizzi b. 1888, my great grandfather Arturo Lizzi b.1859, and great, great grandfather Biagio Lizzi were born in Troia. I will be visiting Troia and would love to know what offices in troia I should visit and their addresses. I would like to know if any relatives still are there. my great granmother name is Antonia del Vecchio & she came to America but why she did not use Lizzi name? What cemeteries in Troia have Lizzi graves especially Biagio & Grazia Lizzi my great great grandparents. thanks. Fred! My grandmother’s maiden name was Lizzi. I believe her father was Gabriel Lizzi born in Foggia around 1889, married to a Lydia Iacavone(sp). From what I could find, he came to the US around 1912. Trying to find any information I can as all connection was lost with that side of the family decades before I was born. Maybe we’re distant cousins? Feel free to contact me! My great grandfather was Giovanni Lizzi (known later in the US as John Joseph Litzie) – born in Troia in 1893. He married Anna (Ann) Polizzo. He immigrated to the US in 1897. I cannot find any information on who his parents were. Any leads? If you would like to start a research in Troia please send your request to troia@italianside.com.